When it comes to heart attacks, doctors say that time is muscle. No one understands this better than the paramedics of the Fairfield Fire Department, Vacaville Fire Department and Medic Ambulance. They are first on the scene when a “9-1-1” call is made for a possible heart attack. So when NorthBay Medical Center took on the challenge of becoming a nationally accredited Chest Pain Center, the community’s life savers were on board from the beginning.”What happens to the patient before they get to the hospital can be critical to their survival,” says Mary Hernandez, RN, MSN, clinical practice manager for the Emergency Department. “Our journey to accreditation as a Chest Pain Center brought hospital staff and the local emergency response staff together to cross-train and learn how to best implement life-saving treatment.” Studies show that if a patient who is having a heart attack receives treatment within 90 minutes, the chances of saving damaged heart muscle greatly increase. With that goal in mind, cardiologists and emergency physicians provided education for paramedics while the ER staff learned from paramedics how patients are cared for in the field. Together they developed a streamlined system of care for patients with chest pain. EMS personnel and hospital staff now meet on a regular basis to review cases and participate in training exercises. “The Chest Pain Center means patients are minutes away from care, which keeps our response teams close to home too,” says Fairfield Fire Chief Vince Webster. The Society of Chest Pain Centers stresses a structured approach to care that uses evidence-based, best-practice standards for heart attack treatment. 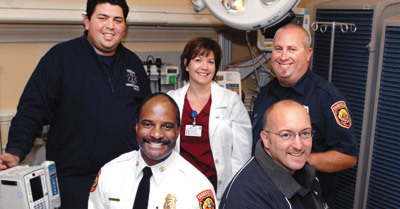 Within the hospital, the Cardiology and Emergency Departments integrated their services to provide patients with immediate medical evaluation by a team of emergency physicians, cardiologists, and emergency nurses who have received extensive training in triage and rapid interventions for cardiac patients. In August 2009, NorthBay Medical Center became a nationally accredited Chest Pain Center—­one of 17 accredited centers in California and 500 in the world. With specially trained and accredited staff available 24 hours a day, seven days a week, the Chest Pain Center can quickly determine if a patient is experiencing a heart attack and move them to the next level of care. Supporters of the Chest Pain Center include (standing from left) Medic Ambulance Operations Manager James Pierson, Mary Hernandez, R.N., M.S.N. ; and Fairfield Fire Station 37 Engineer, Paramedic Andy Cranston and (seated from left) Fairfield Fire Chief Vince Webster and Medic Ambulance Paramedic Ben Davis.